Previously I’ve reviewed several ReadWriteThink apps. You may remember Word Mover and Trading Cards, Theme Poems, Alphabet Organizer, and Haiku? Acrostic Poem is another free app by generous developers, ReadWriteThink. It’s a great way to introduce children to writing poetry because it supports them and gives them a concrete framework to operate in. 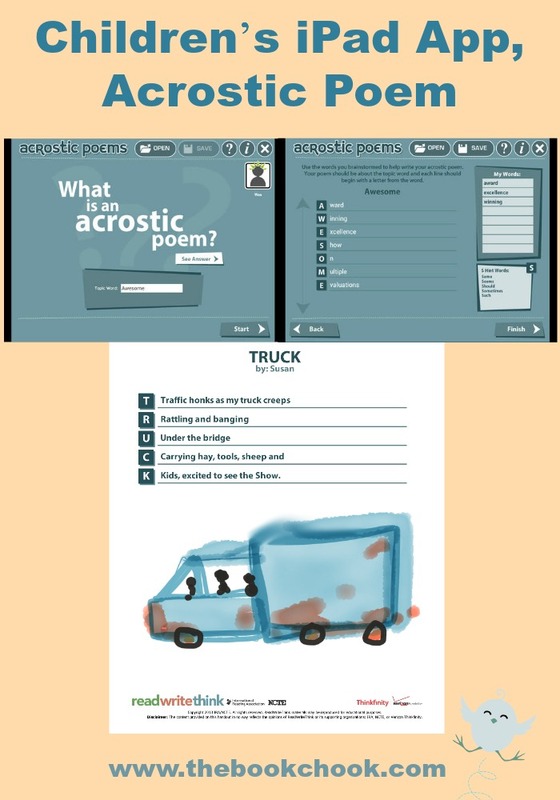 Acrostic Poem is available as an online interactive, in iOS and in Android. There are also lesson plans to support it. This app allows users to learn about and write acrostic poems, a poetry form that uses the letters in a word to begin each line of the poem. All lines of the poem relate to or describe the main topic word. This educational tool allows users to first brainstorm words to help write their poem. Work can be saved in progress to revise and edit, which reinforces elements of the writing process. Users can send their finished poem to their device’s camera roll or email it as a .pdf file to friends and family. As usual, this ReadWriteThink app is free, works well, and works straight out of the box. Acrostic Poem encourages kids to brainstorm words then they are guided to use those words in an acrostic poem of their own. As you will see from my example in the image above, poems are generated as a PDF document with no images etc but I think children would love to use their poem as the basis of some kind of art work they could display and show off proudly to family and friends. The Acrostic app is designed to be used in school, allowing multiple users to create and save poems due to the ability to create multiple profiles. Just as with the other ReadWriteThink apps: Theme Poems, Haiku, Alphabet Organizer and Diamante, children are encouraged to set up a profile and are supported as they proceed through the project. It is saved to the camera roll once finished, as an individual jpeg file. You may like to check out my iPad App Reviews on Pinterest, and find more apps and articles via my Listly page. If you’re interested in creating Poetry with kids, take a look at my Poetry Resources.